Saliva chicken: so good you salivate at the sight of it. Chinese dishes have very descriptive names which when translated literally can be hilarious and 'saliva chicken' is one of them. Thank God, however, that saliva chicken kou shui ji does not have saliva as an ingredient. Rather, the dish is considered so delicious that it makes you drool just looking at it. 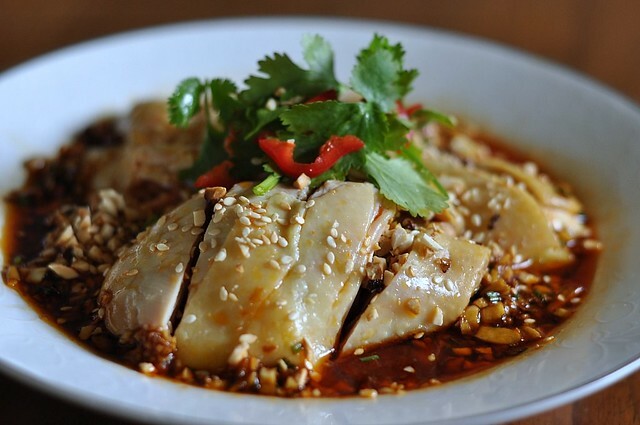 Maybe 'mouth-watering chicken' is a more euphemistic name for this hot, sweet, savory, sour, flavorful and oily dish. English-Chinese translation can really put you in stitches. My kids like to say, out of the blue, "I can help you too much! ", a phrase they read somewhere in Guilin, China which I think was supposed to mean "Excellent service". I still can't figure out what 'Boil The Meat in Vain' is or ' Fry The Rabbit Silk'. I know 'Red Oil Folds Arms' is chao shou, Sichuan-style won tons, only because I am blessed to know Leila, who's from Sichuan where the dish originates. I'm sure 'The Powder Steams The Meat' is steamed meat with flavored flour, a Chinese dish that's very popular in China but less known outside of the country. But what is 'Belly of Money of One Pair of Peppers'? Or 'Duck's Palm of Safe Juice,' for goodness' sake? Saliva chicken is a very popular cold appetizer dish in China and you are very likely to have tasted it if you've visited China, especially Sichuan and the Jiangsu region. The dish is simply plain boiled chicken, very smooth and moist, doused with an intense sauce full of flavors and tastes such as prickly ash oil (the numbing Sichuan peppercorns which I am addicted to), sesame oil, black vinegar, peanuts, garlic, chili oil...the whole list is in the recipe below. I adapted the recipe from here, where you will need a lot of imagination if you don't understand Chinese. I added light and dark soy sauce and had to leave out the 2 teaspoons of 'grow and smoke' because I just can't figure out what they are. The sauce can be made ahead, and the chicken too so this really is an easy dish. It reminds me of the popular Sichuan Garlic Pork. Serve saliva chicken very cold as an appetizer and you'll know why it's drool-worthy. * I think restaurants add msg to this dish. At home, Maggi soy sauce would give some xien or umami taste. 1. Prepare the chicken and arrange on a deep dish. Keep covered in the fridge and chill at least 1/2 hour. 2. Mix the sugar, sesame paste, ginger, onions, vinegar, wine and soy sauces in a bowl. Taste and adjust sauce to your liking. 3. 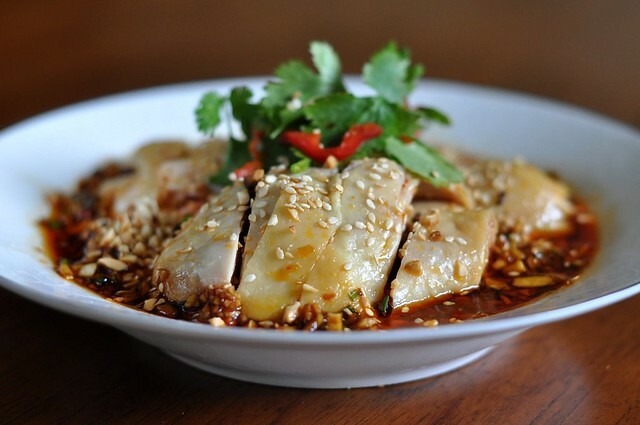 Just before serving, pour the sauce over the chicken, sprinkle the sesame seeds and peanuts over, drizzle the peppercorn and chili oils over and garnish with the red chili slices and coriander leaves. I tried this dish in one of the Szechuan restaurant in BoxHill..the sauce was excellent but the chicken was horrible. Tasteless and soft. I miss our village chic back home, those with yellow skin! oh no!! Another tempting dish... there goes my diet!! Hehehee..
Ok.. will do this dish this weekend. I suspect "fry the rabbit silk" is 炒兔絲, with 絲 being the "silk" part, though in this context it actually means "shredded", so the dish would be stir-fried (炒) shredded rabbit (兔). "Duck's palm of safe juice" could be 泰汁鴨掌 — 泰 does mean "safe", but it also means "Thailand" (I think this is phonetic? It's pronounced tài.) 汁 is "juice" or "sauce". 鴨 is "duck", and 掌 is "palm", but 鴨掌 is "duck web", i.e. duck feet. So this is Thai-style duck feet. drool! looks like my type of dish! Oh wow! You're right! This dish is drool-worthy! Just thinking of it and im already drooling! Thanks for sharing. I've bookmarked this page to try this recipe out soon! This is extremely yummy!! I made this and ate every single morsel of it!! Easy to make and it is very appetising.. I am sure going to keep this and make this over and over and over again!! pp: i know what you mean. hey, i find the chickens in china n hk even better than ours--yellow thin skin, n firm tasty lean flesh. food: so happy tt you like it! kake: tt's brilliant of you! 'duck's palms' is duck web, how come i didn't think of tt lol! malaymui: just zip over to sh n yi'll take you to the best sichuan restaurant! yi: eat it in sh...u'll get sick of it bc huiyi likes to order it.